In my women's Bible study we are doing a wonderful study on David written by Priscilla Shirer, Beth Moore and Kay Arthur. Yesterday Priscilla kicked off the study with an insightful message about David's anointing. She reminded us that not everyone thought he was the likely choice for the next king. After all, people have a certain image in mind when they think of a king. I've always been intrigued with the contrasts between Saul, Israel's first king, and David, the king God appointed because he was a man after God's own heart. Remember why Israel got a king to begin with? They just had to be like everyone else. God was supposed to be their king and He had appointed judges and priests to guide them. These were spiritual leaders, but the people wanted political leaders like everyone else. They wanted royalty. And so, royalty is what they got. Saul was appointed king by God because he was exactly what the people expected, what they wanted. First Samuel 9:2 says Saul was "a choice and handsome man, and there was not a more handsome person than he among the sons of Israel; from his shoulders and up he was taller than any of the people." He looked the part and God knew that was what was most important to the Israelites. I'm kind of thinking that is still true today. But when God had about had it with Saul's shenanigans He sent His servant Samuel to anoint a new king, one who would tell the truth when approached about his sin, one who would value God's presence more than God's physical blessings, one who would ask God for instructions and follow them instead of doing his own thing, and one who would seek out the Lord rather than running from Him. He sent Samuel to anoint David, a man after God's own heart. David didn't necessarily look the part of a king evidently. I think Hollywood made a movie about David a number of years ago and if I'm not mistaken Richard Gere played the role of David. I think Gere is pretty handsome and I have a feeling he looks more like Saul than David. We like to think of David as extremely good-looking, but all the Bible really says about his appearance is that he was ruddy in complexion, probably from spending so much time outdoors with the sheep. He obviously didn't look like a king to his brothers or his father. They were all amazed when Samuel anointed him. And he didn't look like much of a threat to Goliath the Philistine. He mocked him when David approached him in battle. But of course he may have grown into a fine specimen of a man. Still the point is, he did not look like king material when Samuel anointed him for the job at the age of 15. I met a king of sorts who didn't look the part either. In fact this man looked plain out scary the first time I saw him. 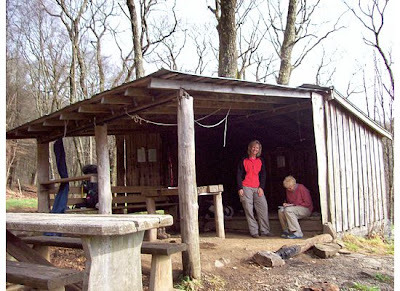 My friend Kim, my Aunt Ida and I were on our first day of our Appalachian Trail adventure a few years ago. As our luck would have it, rain began to fall on us just as we hit the trail. We didn't get to go as far as planned that first day because of the heavy downpour and were forced to stop at the first shelter we came to even though it was only about 3 o'clock in the afternoon. When we stopped at the shelter there were already five men lying on the rustic floor of this three-sided room. They didn't seem thrilled that three women would now expect them to "move over a bit" and we weren't thrilled to be spending the night with the five unshaven, smelly guys who had obviously been on the trail a while. This picture was taken the next morning when the guys had all left. But we settled in for a long evening while the rain came down in buckets just feet from us, glad to have shelter of some kind. As I laid on the very edge of the floor (like where you see my aunt sitting in the picture above except on the other side of the shelter) I whispered to Kim, "Are you alright with this?" meaning the situation of having to spend the night with these five strange men on our first night out. Kim thought about it a few seconds and then replied, "I'm fine with everything except that ax murderer over there" and nodded toward a small, scraggly man who had been sitting in one position and staring into space for the past three hours, maybe longer. This man looked ancient. He was thin with a white scruffy beard. And the creepiest thing about him was that he literally had not moved since we got there hours earlier. He did indeed look dangerous. 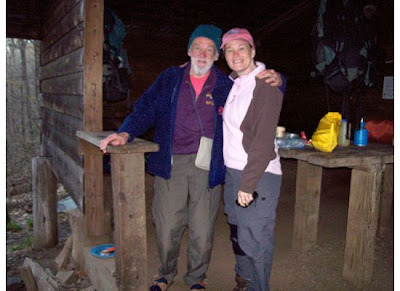 We didn't sleep much that night, being our first night on the trail and all, plus the uncomfortableness of sleeping with five strange men. But I must have dozed off at some point because I remember waking up and realizing that the men were all packing up and leaving. It was early yet, so we decided to stay in our sleeping bags until most of them had left. By the time we got up, the ax murderer was gone. Two nights later we ran into the ax murderer again at another shelter. But this time, in the pink light of a beautiful sunset and with a the new perspective of "seasoned hikers" he didn't look quite so dangerous. In fact, he looked friendly enough that Kim, who had labeled him an ax murder just two nights earlier, ventured out and spoke to him. Turns out this gentlemen was in his 80s and doing the whole AT (2,175 miles) for his second or third time. He was a retired professor of engineering and a recent widower. He was doing the trail by himself and making decent time. He spoke with a British accent and a soft voice. He was a kind and gentle man. His trail name was Green King. This is Kim with Green King. He wasn't at all what we thought that first night! And thus the lesson, things (or people) aren't always what they seem to be. What is on the inside doesn't always match up with what appears to be on the outside. And obviously God values the inside more. Final thought: if God values what is on the inside more and I probably should too, shouldn't I be spending more time developing what is on the inside than what is on the outside? How much time do I spend on developing my heart, my character? How much time am I guilty of spending on my skin, my nails, my hair, my face, my clothing? Not that the outside shouldn't matter at all. I don't think that is the message here. But certainly I should be devoting myself to inner development if that's where God's gaze is set. Do you have some great ideas for how to develop the inner man or woman? I'd love to hear them.